Medium to large size deciduous shrub with narrowly oval, dark green leaves, paler on the undersides, often turning red in autumn. 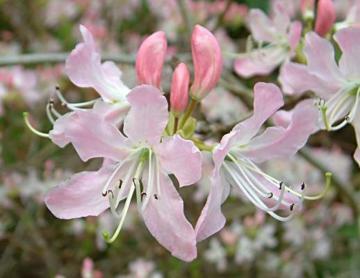 Trusses of delicate, pale pink, rose-pink or white flowers in mid and late spring, before the leaves. Moist, well drained humus rich acid soil. Thrives in full sun or part shade. Endemic to North Carolina, USA.